Tags are labels you create to help organize your contacts. Tagging lets you bring your own contact structure into Mailchimp and label contacts based on data only you know about them. Tags are highly customizable, so you can create and assign them as you see fit. In this article, you’ll learn the basics of tags and how you can use them to organize your audience. Here are some key things you should know about tags. 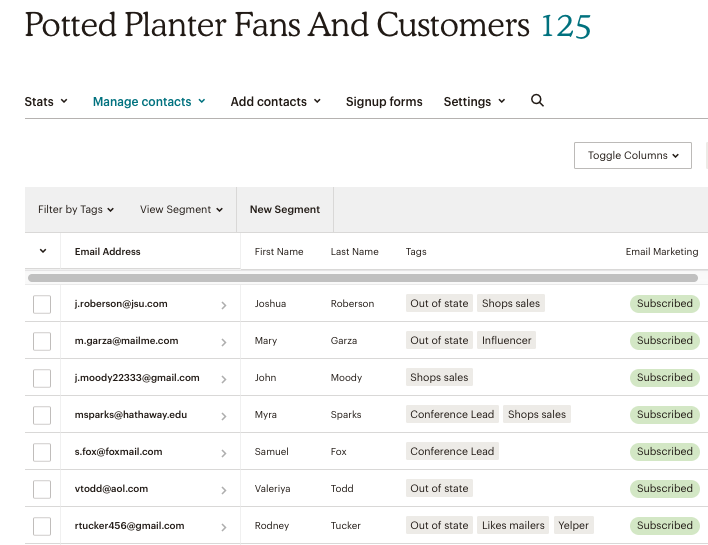 Tags, groups, and segments are the main audience management tools you’ll find in Mailchimp. Learn more about how they work together. Tags are built for your own, internal audience organization. If you want your contacts to self-select an interest or category for themselves, use groups first and then apply tagging if you want to. Think of tags as labels for your contacts that help you stay organized. If you’ve ever worked with a customer relationship manager (CRM) or even a blogging platform before, you might have used a tagging feature to categorize people or content. In Mailchimp, tags are a way for you to label, or categorize, contacts based on information only you have about them. Tags are completely customizable, so you can use them however you need to. 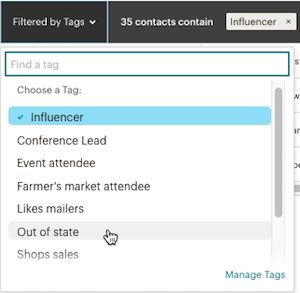 You might want to create a comprehensive tagging structure to organize all your contacts, or you might just need a few tags as a lightweight way to identify some key contacts. Either way, tags give you the flexibility to bring the system that works for you and your business into Mailchimp. 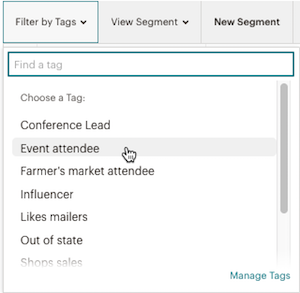 After you create tags and add them to your contacts, you can send campaigns directly to tags in your audience, or use tag data to build segments and further target your contacts. You can also create an automation that triggers when you add a specific tag to a contact. There are a few ways to work with tags. You can create and add tags from the contact table, individually from a contact’s profile, or from the Tags page in your audience. You can also import contacts and add a tag to your entire import, or add a tag when you add a single subscriber. The method you use for tagging contacts depends on what you’re doing and how many contacts you’re working with. For example, if you only need to tag a couple of people, you might choose to do that on the contact table or in their profiles. However, if you need to tag a large number of contacts, you might want to head to the Tags page where you can tag in bulk. If you need to tag brand new contacts, consider importing to a tag. Tags you’ve added to contacts display on the overall contact table. You can also view all the tags added to a specific contact on their contact profile page. After you’ve added tags to contacts, you can filter your contact table by tags. Click the Filter By Tags drop-down menu, and choose the name of the tag you want to filter by, or search for a tag. To filter by more than one tag, click the Filtered by Tags drop-down menu and choose an additional tag. Repeat this process to filter by up to 5 tags at a time. Click the X icon inside a tag to remove it from your filter, or the X icon in the upper-right corner of the table to clear your entire filter and start over. To view which tags contacts have in common, navigate to the contact table, check the box next to each contact, and click the Add Or Remove Tags drop-down menu. We’ll display a checkmark next to tags all of the selected contacts have in common. If some, but not all, of the selected contacts share a tag, we’ll display a minus symbol (-). Your audience includes a Tags page where you can manage all your tags in one place. You can create or delete tags, view contacts assigned to a given tag, send to a tag, and more. Learn more about the Tags page. We know it can sometimes be hard to decide how to make such a flexible feature work for you. Here are some examples of tags you might create, depending on the type of business you have.